Governor Andrew Cuomo, The Walt Disney Company, Marvel and Netflix Inc. today announced that Marvel's landmark live-action television series, which will bring Marvel's 'flawed heroes of Hell's Kitchen' characters to Netflix, the world's leading Internet TV network, will principally film in New York State. Produced by Marvel Television, in association with ABC Television Studios, this groundbreaking series is Marvel's most ambitious foray yet into live-action television storytelling and represents the largest film or television production project commitment in New York State history. Filming is set to begin in the Summer 2014 and will create at least three thousand jobs in New York State including up to 400 full time jobs. 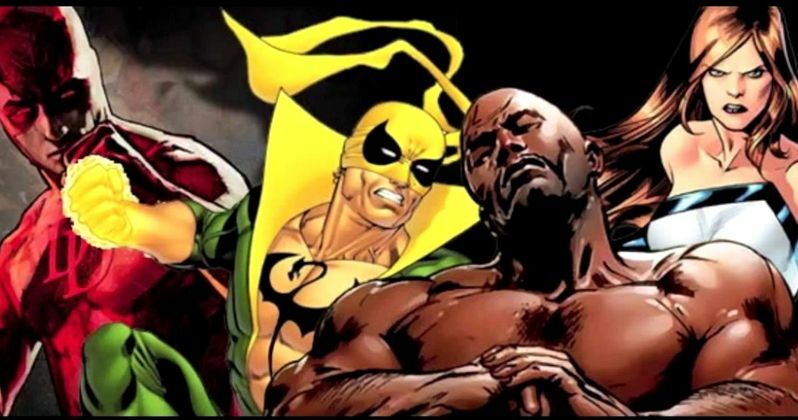 The project will include nearly 60 one-hour episodes focused on the 4 The Defenders characters: Daredevil, Jessica Jones, Luke Cage and Iron Fist. "New York is where the entertainment industry started, and this unprecedented commitment from Disney and Marvel is further evidence that we're bringing it back bigger and better than ever before. And when the entertainment industry thrives, it fuels dozens of other industries and businesses. The competition for these projects is fierce and Disney could have chosen to film these shows anywhere, but they knew that shooting in New York means getting to work with the best in world. These shows bring New York's superheroes home where they belong - along with hundreds of jobs and millions of dollars in new business." "Since 2008 Disney has directly contributed almost half a billion dollars to New York's economy through television and film production, along with approximately 9,000 jobs for New Yorkers. The Governor's policies make this great state a more affordable and attractive location, opening the door for even greater economic investment and job creation for New Yorkers. Our Marvel series for Netflix will inject millions directly into the local economy and create hundreds of new jobs." "We thank the Governor and the great state of New York for helping us create the ultimate backdrop to this epic series. Setting our production in New York City truly underscores the authenticity and excitement we plan to bring to The Defenders and their 'flawed heroes of Hell's Kitchen' stories." Last November, Disney and Netflix announced an unprecedented deal for Marvel TV to bring multiple original series of live-action adventures of four of Marvel's most popular characters exclusively to the world's leading Internet TV Network beginning in 2015. This pioneering agreement calls for Marvel to develop four serialized programs totaling 52 one-hour episodes culminating in a four to eight episode mini-series programming event. Led by a series focused on Daredevil, followed by Jessica Jones, Luke Cage and Iron Fist, the epic will unfold over multiple years of original programming, taking viewers deep into the gritty world of heroes and villains of Hell's Kitchen, New York. Netflix has committed to a minimum of four, thirteen episodes series and a mini-series event in which the Marvel characters from the first four series team up as The Defenders much like Marvel's The Avengers.
" The Defenders are classic New York characters; smart, resourceful and tough enough to always stand up for what's right. We're delighted they're coming to life on their home turf thanks to Governor Andrew Cuomo and his team." When Governor Andrew Cuomo took office in 2011, he made the attraction of the film and television production and post-production industries, and jobs and the economic impact they bring with them, a key part of his overall strategy to grow New York State's economy. Since that time, he has signed into law several important changes to both programs to make New York more competitive in this global marketplace, and the results have been significant. Both programs enjoyed record-breaking years in 2013, bringing billions of dollars in new spending and thousands of jobs into the Empire State. The stability provided by multiyear funding has particularly encouraged the development of television series production work, like the new Marvel series, as well as long term investments in infrastructure, all of which creates thousands of jobs directly and indirectly related to the actual productions themselves. Hire an estimated 128,165 actors and crew for the 183 projects submitted. "The men and women of the IATSE look forward to participating in this ground breaking endeavor. Thanks to the vision of Governor Andrew Cuomo and the Legislature, the long term funding of the production incentives gives employers the comfort they need to invest in these new avenues of entertainment, which will provide thousands of new jobs with good wages and benefits." "Theatrical Teamsters Local 817 is thrilled that Marvel's newest television series will be filmed in New York. This long-term commitment is an incredible accomplishment that will bring not just jobs, but also stability to our members work and family lives."